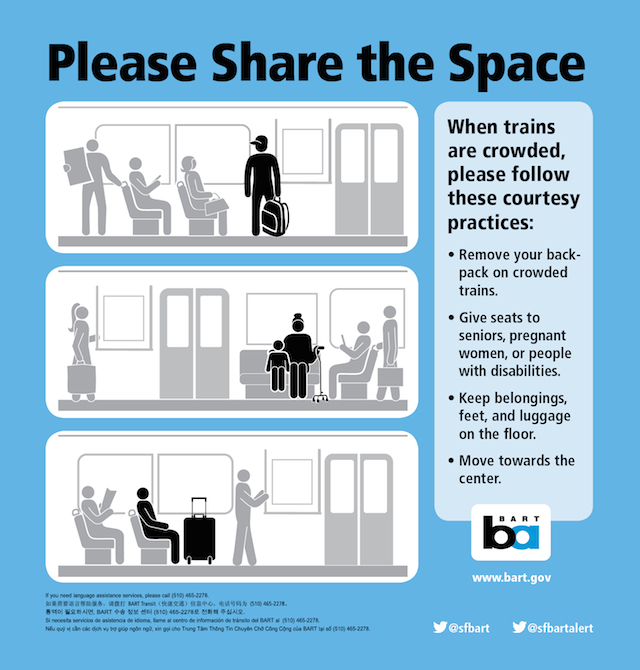 Because people sometimes often need advice on how to act like decent human beings, BART has issued new courtesy posters and a “crowded car survival guide” video aimed at teaching riders how to act on its trains. The poster and video tackle the often griped about backpack problem, how to let people off before you board, as well as no-brainers like giving your seat to pregnant, elderly, and disabled riders. Noticeably absent is the controversial topic of manspreading. BART just didn’t want to go there, we can only guess. Two things: Save personal grooming (brushing teeth, flossing, toenail clipping, applying underarm deoderant, etc.) for the privacy of your own home and have the simple courtesy to let people off before you push your way on. Thanks!